White horse imaginings – For the fainthearted . . .
Would George Foley have delighted in seeing such an animal? In Michael West’s play Foley, George Foley is an ageing, angry man. He is alienated from the Roman Catholic community by his Protestant roots and alienated from his Protestant roots by his half-hearted conversion to being a Roman Catholic at the time of his failed marriage. In my fallible memory of the play, Foley speaks with pleasure of seeing a horse in a field near his crumbling house. I probably misunderstood the intended significance of the horse in the hour and a half long monologue, but in the years since it has acquired retrojected meanings; it has become a motif of hope, of beauty, of unexplored possibilities, of the thin place between imagination and reality. 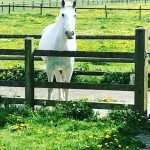 Grazing in the field, to which the untidy garden sloped, was a stocky brown horse with a white flash down its nose. Beyond, hounded by a beech hedge, where the leaves inde­pendently maintained their autumnal rust, lay further fields, where young spring wheat was forming a green glaze over the soil . . .
. . . And now, as if to add fuel to this fire, a sliver of sun appeared above one of the breast-like hills, a mere slice of orange which rapidly grew to an incandescent globe. Rifts of glowing red infiltrated the green-grey sky which began to take on further intimations of light. ‘Be praised!’ said Mr Golightly. He did not speak aloud, but as if to a beloved intimate whose understanding had no need of outward hearing. Samson, the horse, perhaps catching the drift of the unspoken words, made its way up to the wire which formed a boundary to Spring Cottages garden. “Hello, old boy.” Mr Golightly ran a finger down the long plush nose and wished he had thought to bring sugar lumps. The cardboard box he had brought was packed with some of the items he might have difficulty finding in the average English village shop: tins of anchovies, jars of pickled walnuts, Marmite, a pot of moist Stilton, chillies, pine kernels, a French sausage, Frank Looper’s Oxford marmalade, sugared almonds — but despite these latter items Mr Golightly did not, in general, have a sweet tooth. He had not been raised on sugar and consequently it did not form part of his regular diet. ‘Sorry, old chap.’ He spoke regretfully: he liked to indulge animals who rarely bore resentment if one failed to do as they wished. 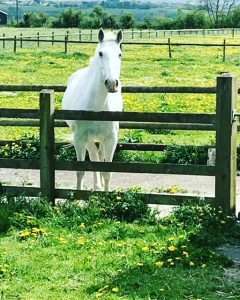 Horses in childhood days spoke of heroism, of Westerns, and knights in armour, and King Arthur and his Round Table; horses spoke of romance and excitement and worlds far from the humdrum life of rural Somerset. Anyone with a horse had about them an aura unmatched by any other possession. 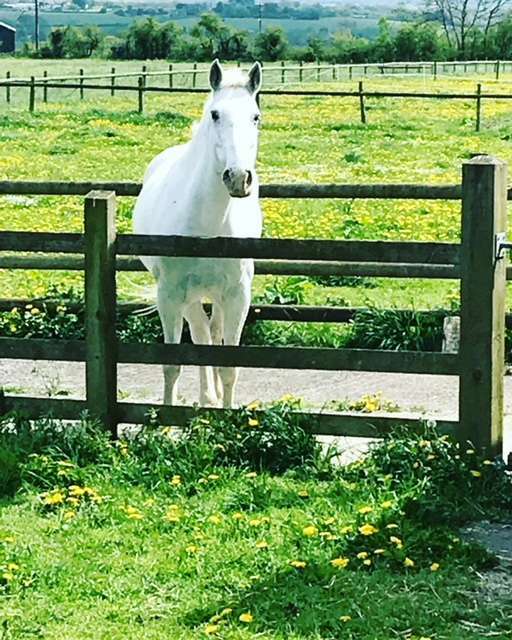 Passing the gate across the road, a white horse (or is it a grey horse?) stood in the warm May sunshine, stood looking expectantly, as if in hope of galloping of to some adventure. At once there were conjured memories of Foley, and Golightly, and Arthur riding from Camelot, and the great wizard Gandalf on Shadowfax. What other creature has such potential?